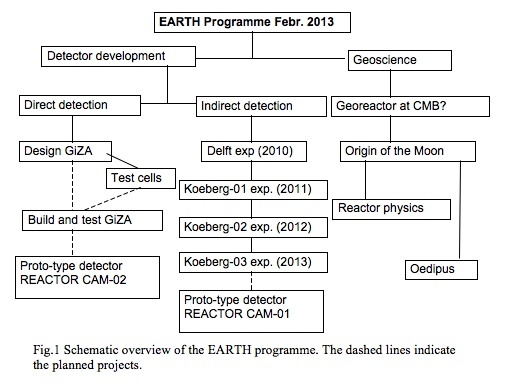 To achieve the Earth antineutrino tomography requires a number of crucial steps in detector development, each followed by a go/no-go decision. This has the advantages that the programme has well-defined stages, each stage being precisely defined by the end of its predecessor. It starts out relatively small with an appropriate budget and will grow in time both in size and in budget. In parallel to technological developments better knowledge is acquired on the radiogenic processes inside our planet; both the types of process and the distribution of the heat sources. This section presents an account of “the road we travelled” to the present situation as outlined in the scheme below and the points to the directions for the near future. We will describe the developments and plans in two subsections: detector development and geoscience. As outlined in the scheme above detector development has progressed along two lines: direct and indirect detection. The direct detection is based on the capture of an antineutrino in a hydrogen nucleus which leads to the emission of a positron and a neutron which subsequently will be detected. The indirect detection is based on the hypothesis that anti-neutrinos may affect the nuclear β+-decay and thereby alter the decay rate of a radionuclide. Direct detection is the most common way of detecting antineutrinos it is the basis for the large antineutrino detection systems as Rovno, KamLAND, or Double-Chooz. In these detector systems the positron is detected by the two Eγ=511 keV γ-rays following the annihilation of a positron-electron pair. Also the neutron is detected via γ-rays following the decay of the nucleus formed after capturing a neutron. Favourable capture nuclei are H and Gd. The detection by γ-rays is the loss of direction information, the large mean free path of the γ-rays, and the sensitivity to contributions of other γ-rays in the background. We are the first group that proposed a direction-sensitive antineutrino detector and deviate from the γ-ray detection by proposing to detect antineutrinos by the slow-down signal of the positron and signal of the α-particle following the neutron capture in 10B or 6Li. Earth, Moon and Planets, 99, (2006), 193-206. Proceedings of Science, FNDA (2006) 96. Based on these experiences, a next generation detector has been designed and a number of potential scintillator materials have been selected for optimizing the detector performance. Using fast digital ADCs and developing a special algorithm, the Signal and More group at the KVI, University Groningen, the Netherlands were able to show that the arrival time difference between two pulse-generator pulses, one direct and the other delayed by 10 ns, could be measured with a precision of 10 ps. In stage 1 it was realised that to achieve a decent count rate at a nuclear power reactor the volume of the detector had to be about 40 litre or more. A segmented multi detector structure would still require many elements each equipped with two Photo-multiplicator tubes (PMT) be read out individually. This approach would be rather complex and expensive. With special algorithm developed by the KVI-group we could use a single volume and determine the location of the interactions from the difference in arrival time at, at least, three PMTs. We opted for a tetrahedron (pyramid) shape with a PMT at each of the (truncated) corners. Because of its shape the detector was called GiZA, an acronym for Geoneutrinos in ZA. ASTRON (Dwingeloo, NL) offered us, as a contribution in kind, to make a simulation of the light propagation inside GiZA. After the design was optimised the construction design of the detector was carried out by SCIONIX Holland B.V. (Bunnik, NL) with financial support by SENSOR UNIVERSE, Assen (NL). An conceptual image of the detector is given in the figure 3. It shows the PMTs mounted on the truncated corners of a tetrahedron. Before GiZA can be built we have to investigate the optimal scintillation liquid and obtain the financial support to construct GiZA. To examine the liquid scintillators a number of test cells were acquired from SCIONIX HOLLAND B.V. (Bunnik, NL) again with financial support by SENSOR UNIVERSE, Assen (NL). To read out the signals two PMT tubes were made available as a contribution in kind by PHOTONIS (Roden, NL). The equipment was shipped to iThemba LABS, Faure (RSA) and were investigated as part of the MSc thesis of Jaco Blankenberge and by PhD student Milton van Rooy, both at the Department of Physics, University of Stellenbosch. Two liquids were investigated EJ309 and EJ339 (ELJEN, USA). The former liquid contains 5% natural B, the latter 5% enriched B and have flame points at 144°C and -8 °C, respectively. With analogue electronics they showed that for EJ309 a good pulse shape distinction (PSD) can be made between gammas, neutrons and α-particles. Angus Comrie investigates the properties of the cells with digital electronics as part of his PhD work at the University of Cape Town. In parallel new type of scintillators are being developed in a collaboration between INCAS3, Assen (NL) and the Stratingh Institute of the University of Groningen (NL). After optimising the work on the test cells and the scintillation materials, and after obtaining sufficient funding for a test detector of GiZA test will be made at a nuclear power plant, provided we fulfil the safety conditions. In addition we also consider a comparison of GiZA with a segmented detector. Out of the tests and comparisons a proto-type detector will evolve as a step to a commercial Compact Antineutrino Monitor, named in figure 1 as REACTOR CAM-02. In an article of the New Scientist of June 2009 (J. Mullins, 2009) it was mentioned that Ephraim Fischbach and Jere Jenkins had interpreted annual oscillations of 0.3% in the decay rate of 32Si as found by Alburger as an effect of neutrinos on nuclear beta-minus decay. The Earth-Sun distance varies 3% over the year and the oscillations found by Alburger fit precisely with a corresponding 6% change in solid angle and could be caused by the corresponding change in solar neutrino flux of 6*1010 cm-2.s-1 of which 1/3 are electron-neutrinos, due to the averaged exchange with other neutrino flavours. If we assume that antineutrinos and neutrinos behave in the same way an estimate on the change in the exponential decay rate of beta-plus decay due to a change in antineutrino flux can be estimated. The background flux of antineutrinos due to processes in Earth is of the order of 106 cm-2.s-1. At a 1 GWth power reactor the flux of electron-antineutrinos is 4*1012 cm-2.s-1 at 20m from the core, which means that at a distance of about 300m from such a reactor, the electron-antineutrino flux would be similar to the solar-neutrino flux, if flavour effects are ignored for the antineutrinos, or, if the effect were to be linear with the relative change in flux. In this case one should notice a reduction in the decay rate of 5% between reactor-on and reactor-off. An effect of this magnitude would allow us to monitor the state of the reactor and probably even its fissile content at distance as far as 300m or more. To investigate this possibility an experiment was carried out at the 2 MWth research reactor at the Delft University of Technology. This reactor is on during week days and off during the weekend. A measurement over 200h was carried out at a distance of 8m from this swimming-pool reactor with a HPGe detector and calibration sources of 22Na, 54Mn, 137Cs and 152Eu. A gamma-ray spectrum, measured during the reactor-on1 period is shown in fig.4. It shows how clearly the lines belonging to the decay of the various sources stand out over the continuum and indicates the statistical precision that can be obtained. Based on this approach the measured changes in count rate were analysed. From this analysis we conclude that if the interpretation of Jenkins et al. were to be correct our result limits any possible effect to <3*10-4. This is a factor of about 400 lower than would be expected from the inference of Fischbach and Jenkins, under the assumptions that the influence of electron antineutrinos on β+-decay is the same as for electron neutrinos on β--decay and the effect being proportional to the flux. This limit also holds if we assume that the influence of antineutrinos on β+-decay and β--decay is the same. Hence either the hypothesis of Jenkins et al. is not true or the effect of neutrinos on β--decay differs considerably from the effect of antineutrinos on β+-decay. Applied Radiation and Isotopes 69 (2011) 320–326. As the result of the measurements at the reactor at Delft (NL) provides an upper limit for the effect could still allow changes in the decay rate of beta-plus emitters to be detected at a distance of about 30 m from the core of a 1 GWth reactor, we were granted permission for permission for measurements at such a distance of one the 1 GWe power reactors of the Koeberg Nuclear Power Station, about 30km northwest of Cape Town. Unfortunately, all three series of measurements carried out thus far have had experimental difficulties during long-term measurements (breaking down of an amplifier, during a switch from reactor-off to reactor-on, a malfunctioning detector and malfunctioning hard- and/or software of the electronic base). We hope to resolve the latest problem soon and to report the results. The measurements and their analysis form the basis for the PhD thesis at the University of Stellenbosch (RSA) of Milton van Rooy. If there is indeed an effect of antineutrinos on β+-decay, such measurements would allow reactor monitoring. In that case a Compact Antineutrino Monitor (CAM) can be designed, proto-typed and eventually turned into a commercial product. In figure this path has been indicated and leads to REACTOR CAM-01. Georeactors in the Core-Mantle Boundary of Earth? A literature investigation was made on the feasibility and implications of nuclear georeactors in the Earth's Core-Mantle Boundary (CMB). In the investigation it was found that a mineral called Calcium Perovskite (CaPv) becomes stable at pressures occurring in the lower mantle of the Earth (at depths exceeding ~660 km) and remains stable near the CMB. A property of CaPv, caused by the presence of large-size Ca atoms, is its ability to incorporate large amounts of U and Th, such that almost all fissile materials in the CMB could be concentrated in CaPv. If no further concentration of CaPv occurs (fully homogeneous distribution) the fissile materials are an order of magnitude too low in abundance to reach criticality levels of a georeactor. South African Journal of Science, 104, (2008), 111-118. Are there nuclear reactors at Earth's core? It may sound strange but the question of how the Moon was formed still has not been fully answered. At the end of the 19th century the first scientific hypothesis on the formaton of the Moon was put forward by George Darwin (the second son of Charles Darwin) namely that the Moon was extracted by the attraction of the Sun from a fast rotating hot Earth in the early period of the beginning of our solar system. At that stage the Earth was not yet solid and, with a rotation period of 2.7h, the proto-Earth was at the edge of stability and a small change in the solar attraction would be sufficient to separate a “blob” of Earth and form the Moon. Consequently the Moon would be very similar to the Earth in elemental and isotopic composition. In the beginning of the 20th century this hypothesis was rejected because there was no explanation for the large mismatch in energy and angular momentum (a measure of the rotational motion) between the proto-Earth and the present Earth-Moon system. In the middle of the 20th century two new hypotheses were brought forward: one in which the Moon was formed in the same way as the Earth at the same time and same distance from the Sun (co-accretion model) and another in which the Moon was a captured celestial body formed elsewhere in the solar system. These hypotheses could be rejected after the Apollo and Luna mission had brought about 380 kg of material from the Moon's surface, and seismic stations and a radar reflector were placed on the Moon. In figure 6 the sizes of the iron-rich cores and the silicate shells of Mercury, Venus, Earth, Mars, and Moon are compared. The Moon data have been derived from the seismic data collected by the seismometers placed on the Moon's surface during the Apollo missions. From the figure it is clear that the Moon has, compared to the inner planets a very small metallic core. Based on these data the co-accretion model was rejected : the Moon contains too little iron to have been formed at the same distance from the Sun as the Earth. At the ignition of the Sun a large flux of charged particles was sent into the solar system causing nuclear reactions in the dust. These reactions then led to isotopic differences in e.g. Oxygen isotopes. The isotopic ratios in Mars meteorites clearly differ from those of Earth and Moon. The latter two are identical. That evidence together with the low iron content makes the hypothesis of the capture of a celestial body highly unlikely. So after the Apollo and Luna missions and the analysis of the lunar rocks there was no hypothesis to explain the data. A new hypothesis was born when the capture hypothesis was modified into a collision between Earth and a planet the size of Mars (named Theia), known as the Giant Impact Hypothesis. In a rather gentle collision the cores of Theia and Earth merge and a plasma is formed from which the Moon eventually is formed. According to hydrodynamical calculations by Robin Canup et al., 80% of the Moon should originate from Theia. This causes a problem because over time the analyses of lunar rocks have shown an increasing similarity with the elemental and isotopic composition of the Earth. With some adjustments of the model it can be made plausible that equilibration in the plasma leads to similarities for volatile elements like Oxygen, but it is difficult to reconcile this for elements such as Tungsten for a system with a similar (� 10%) angular momentum as that of the present Earth-Moon system. In 2012 Cuk et al. propose a fast spinning Earth, similar to Darwin, being hit by a planet that is significantly smaller than Theia. The discrepancy in energy and angular momentum is removed by siphoning energy and angular momentum out of the Earth-Moon system via a resonance with the Sun after Moon formation. Under these conditions the material ending up in the Moon is made predominantly from Earth material rather than from the impactor and in better agreement with observations. In this paper we describe the nuclear explosion being triggered either by a natural process in which the fissile material in the CaPv has been concentrated to a level of supercriticality, or has reached supercriticality due to the pressure wave induced by the impact of a relatively small asteroid (diameter about 50km). These two options are seen as the boundaries of the energy required for Moon formation by a nuclear explosion in the CMB. Both conditions can be met with the estimated amount of fissile material in the CMB. In this hypothesis the angular momentum of the proto-Earth system was hardly different from the angular momentum of the present Earth-Moon system and since the Moon originates from the Earth it automatically has the same elemental and isotopic composition. In a collaboration with Em. Prof. W. Seifritz, Haussen (CH), the georeactor conditions have been calculated according to traditional empirical calculations. In these calculations we make a conservative assumption by considering that 235U is the only fissile material in the georeactor. The fission cross section of 238U has a high energy threshold and therefore only a small fraction of it can be fissioned. We will also ignore thorium in the excursion since it would increase the absorption probability of the neutrons somewhat, but will not modify theoverall picture. In a short excursion also breeding processes of both 233U from thorium or 239Pu from neutron capture by 238U are irrelevant. As pointed out by de Meijer and van Westrenen, 2010, the geometrical dimensions of a georeactor are much larger than the mean free path of neutrons, hence leakage of neutrons may be ignored. Assuming that only 2% of the fissile material is used in the explosion (in nuclear explosive devices this is about 10%) and requiring an energy of 0.3*1030J for a explosion triggered by concentration, the required volume of the georeactor would be similar to a spherewith a radius of 82 km. A sphere is not a necessity, the most likely shape of the georeactor would be a pancake shape. All these dimensions fit well into the known properties of the CMB. The process of the explosion is very narrow in time. If the time is measured in units of neutron generations, almost nothing happens in the first 50generations. At about 52 generations the explosion sets in and is over after 55 generations. In real time this is a matter of microseconds raising the temperature by 5000 to 10000 K, being the trigger for the shock wave. Although these traditional calculations support our hypothesis for the Moon formation by a nuclear explosion at the CMB, more sophisticated Monte Carlo calculations areneeded. One of the questions raised with respect to our hypothesis on the Moon formation is: did a similar process take place on other planets? Mercury and Venus do not have a Moon, whereas the two small moons of Mars appear to have been captured moons formed elsewhere. Is that consistent with our hypothesis? One of the pre-requisites for our hypothesis on the Moon formation is the presence of CaPv as a concentrator of fissile material. CaPv is only a stable mineral at pressures slightly lower than in the CMB of the Earth. Planets like Mercury and Mars are too small to reach such pressures. On Venus, however, the conditions are such that CaPv can occur as a stable mineral at the CMB and hence the conditions are right for the formation of a moon like our Moon. At present we are further investigating the possibility that Venus had a Moon in the past (called Oedipus), that was captured or lost at a later stage.